On Sunday, July 19th between 11am and 3pm we’ll be at the 4th Bicester Bike and Family Fun Day, held this year on the Annex field of Bicester Community College (behind the leisure centre). This year NW Bicester and Parkwood Community Leisure have teamed up to make the Bicester Bike Day even bigger with a cycling Sportive, inviting riders to take part in 28, 65 and 100 mile races in association with British Cycling. Entry is available via the event’s dedicated website – Bicester Sportive. As with previous years, the day will also include activities for all the family such as cyclo-cross races with Bicester Millennium Cycle Club (BMCC), ‘Tour de Bicester’ treasure hunt style family bike ride, bike security coding and fun family activities including a BBQ, arts and crafts, face painting and bicycle hoopla. And, of course, most important of all, we’ll be on hand to teach people how to diagnose and fix their bikes. 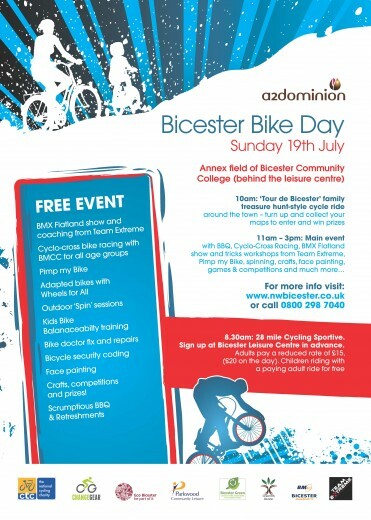 Head over to the Bicester Bike Day website to have a look at the details of what’s on when.